The VJBKXPRS is an affordable, turn-key solution package ideal for use by professionals and up-and-coming video journalists. 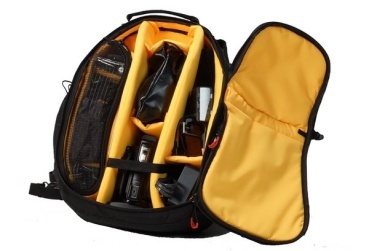 Packaged in a backpack designed for maximum protection and storage of your gear, the kit comes equipped with a compact professional recorder, pro headphones, tripod, LED light kit, as well as cables and accessories -- all the tools necessary for capturing high-quality video. MDR-7506 pro headphones for critical listening of your audio sources. A video tripod essential for keeping the camera steady during interview shots, allowing for making smooth pans and tilts. This tripod also has a remote control built in that will help in capturing smooth shots with your NX30 camera. The kit also contains an "on-camera" LED video light. Having proper lighting on your subject can make a big difference in the quality of your video. This light is dimmable and can be set to match both indoor and outdoor lighting conditions, and is even cool to the touch. It also uses the same rechargeable batteries that the camera uses, or AA batteries.